One major problem of phase-referencing VLBI observations are phase errors due to the unknown tropospheric zenith delay at each antenna. These errors degrade the quality of the phase-referenced image and limit the achievable astrometric accuracy. We will present and compare two independent methods to estimate the zenith delay offset at each antenna. The zenith delay offsets can then be used to correct the data. These corrections improve the quality of the phase-referenced image and an astrometric accuracy of 10 uas can be achieved. With this accuracy, measurements of proper motions in the Local Group become feasible. 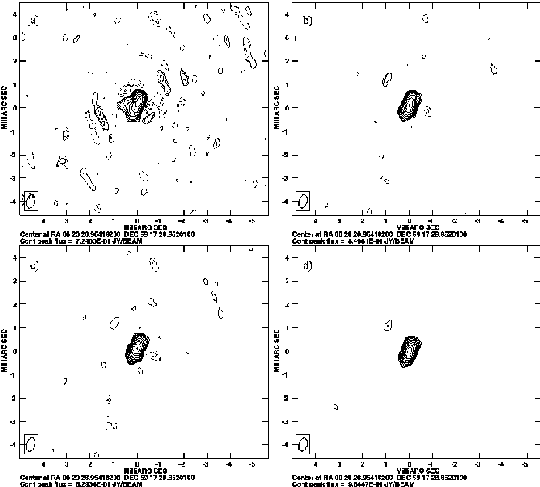 Phase-referenced image of a H2O maser spot in IC 10 without correction a), with atmosphere correction from the fit to the phases b), with corrections from geodetic-like observations c) and after phase self-calibration d). The contour levels start at 25 mJy and increase by a factor of SQRT(2) in all images. The peak-to-noise ratios are 77,101,100 and 151 respectively.